The fisher, a weasel-like predator that is native to the Pacific Northwest. This fisher was brought to Washington’s Gifford Pinchot National Forest from British Columbia. It was released into the wild on Dec. 3, 2015. The Pacific Northwest once held a magnetic pull on fur trappers. It started with the beaver-hat craze and continued with all sorts of animals that could be exploited for their pelts. Of course, the fur-trapping trade has all but vanished from Washington and Oregon. But even today, there are still people out in the woods, trying to track down a sleek, furry creature called a fisher. One of them is Jeff Lewis, a wildlife biologist with the Washington Department of Fish and Wildlife. He’s spent years trying to understand these weasel-like mammals and to help them survive in the Cascade and Olympic mountain ranges. 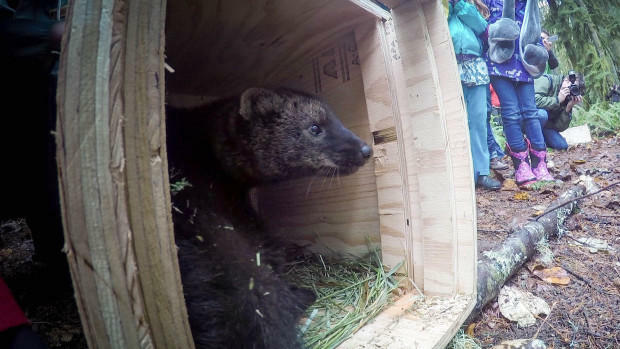 Public agencies and the non-profit Conservation Northwest have been working for 10 years now to bring the fisher back in Washington. They’ve depended on a healthy population in British Columbia, where they’ve trapped the animals for relocation in the U.S. In 2015, Lewis and his colleagues invited schoolchildren to help with the release of some of these fishers into the Cascades south of Mount Rainier (see video below). And last fall, they followed radio signals and used old-fashioned tracking techniques to zero in on evidence that would help them determine whether, two years later, these relocated fishers were making it in their new homeland.